Mycobacterium marinum is an atypical Mycobacterium found in salt water and fresh water. M marinum is the most common atypical Mycobacterium to cause infection in humans. Infection occurs following inoculation of a skin abrasion or puncture and manifests as a localized granuloma or sporotrichotic lymphangitis (see the image below). 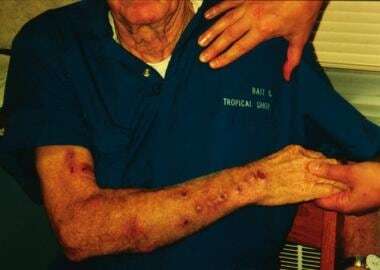 Photograph of Mycobacterium marinum infection lesions. Diagnosis and treatment are often delayed because of a lack of suspicion for mycobacterial involvement, ie, versus more common bacterial pathogens. Due to the increased use of immunosuppressants for transplant recipients and tumor necrosis factor (TNF) inhibitors for a variety of conditions, infections with mycobacteria other than tuberculosis (MOTT) are increasing. After inoculation into the host tissues via an abrasion or other wound, the mycobacteria are phagocytosed by macrophages. Inside the macrophage, they are able to interrupt the formation of the phagolysosome, which would normally kill the organisms. The mycobacteria, however, are able escape the lysosome and can move intracellularly and extracellularly via actin-based motility. This may contribute to cell-to-cell spread. Studies have revealed two pathophysiologically and genetically (ie, via amplified restriction-based polymorphism analysis) distinct populations of M marinum. One group can infect humans and causes acutely lethal disease in fish, while a second group cannot infect humans and causes chronic progressive disease in fish. Infections caused by M marinum are uncommon but well described in the literature. The estimated annual incidence is 0.05-0.27 case per 100,000 adult patients. [9, 7] Of the more than 160 cases described, most are case reports of cutaneous infection; some report concomitant osteomyelitis, tenosynovitis, arthritis, and/or disseminated infection. Nosocomial infection has never been described. No racial predilection is apparent for M marinum skin infection. No sexual predilection has been noted for M marinum skin infection. Lata CJ, Edgar K, Vaughan S. Clinical Implications for the Timely Diagnosis of Mycobacterium marinum in the Age of Biologic Therapy: A Case Report and Review of the Literature. Case Rep Infect Dis. 2017. 2017:5274302. [Medline]. Johnson MG, Stout JE. Twenty-eight cases of Mycobacterium marinum infection: retrospective case series and literature review. Infection. 2015 Dec. 43 (6):655-62. [Medline]. Kent ML, Watral V, Wu M, Bermudez LE. In vivo and in vitro growth of Mycobacterium marinum at homoeothermic temperatures. FEMS Microbiol Lett. 2006 Apr. 257(1):69-75. [Medline]. Clay H, Volkman HE, Ramakrishnan L. Tumor necrosis factor signaling mediates resistance to mycobacteria by inhibiting bacterial growth and macrophage death. Immunity. 2008 Aug 15. 29(2):283-94. [Medline]. Levesque BG, Sandborn WJ. Mycobacterium marinum infection in the setting of antitumor necrosis factor alpha therapy for Crohn's disease. Inflamm Bowel Dis. 2011 Jun. 17(6):1443-4. [Medline]. Aubry A, Mougari F, Reibel F, Cambau E. Mycobacterium marinum. Microbiol Spectr. April 2017. 5(2):[Medline]. Tian WW, Wang QQ, Liu WD, Shen JP, Wang HS. Mycobacterium marinum: a potential immunotherapy for Mycobacterium tuberculosis infection. Drug Des Devel Ther. 2013. 7:669-80. [Medline]. [Full Text]. Aubry A, Chosidow O, Caumes E, Robert J, Cambau E. Sixty-three cases of Mycobacterium marinum infection: clinical features, treatment, and antibiotic susceptibility of causative isolates. Arch Intern Med. 2002 Aug 12-26. 162(15):1746-52. [Medline]. Nor NM, Baseri MM. Skin and subcutaneous infections in south-east Asia. Curr Opin Infect Dis. 2015 Apr. 28 (2):133-8. [Medline]. Doedens RA, van der Sar AM, Bitter W, Scholvinck EH. Transmission of Mycobacterium marinum from fish to a very young child. Pediatr Infect Dis J. 2008 Jan. 27(1):81-3. [Medline]. di Meo N, Stinco G, Trevisini S, De Marchi S, Albano A, Trevisan G. Sporotrichoid Mycobacterium marinum infection in an elderly woman. Dermatol Online J. 2015 May 18. 21 (5):[Medline]. Appelgren P, Farnebo F, Dotevall L, Studahl M, Jonsson B, Petrini B. Late-onset posttraumatic skin and soft-tissue infections caused by rapid-growing mycobacteria in tsunami survivors. Clin Infect Dis. 2008 Jul 15. 47(2):e11-6. [Medline]. Bouricha M, Castan B, Duchene-Parisi E, Drancourt M. Mycobacterium marinum infection following contact with reptiles: vivarium granuloma. Int J Infect Dis. 2014 Apr. 21C:17-18. [Medline]. Ko DY, Song KH. Mycobacterium marinum infection occurring on the face. J Dermatol. 2013 Sep. 40(9):773-4. [Medline]. S Breza T Jr, Magro CM. Lichenoid and granulomatous dermatitis associated with atypical mycobacterium infections. J Cutan Pathol. 2006 Jul. 33(7):512-5. [Medline]. Lam A, Toma W, Schlesinger N. Mycobacterium marinum arthritis mimicking rheumatoid arthritis. J Rheumatol. 2006 Apr. 33(4):817-9. [Medline]. Janik JP, Bang RH, Palmer CH. Case reports: successful treatment of Mycobacterium marinum infection with minocycline after complication of disease by delayed diagnosis and systemic steroids. J Drugs Dermatol. 2005 Sep-Oct. 4(5):621-4. [Medline]. Gluckman SJ. Mycobacterium marinum. Clin Dermatol. 1995 May-Jun. 13(3):273-6. [Medline]. Mahaisavariya P, Chaiprasert A, Manonukul J, Khemngern S, Tingtoy N. Detection and identification of Mycobacterium species by polymerase chain reaction (PCR) from paraffin-embedded tissue compare to AFB staining in pathological sections. J Med Assoc Thai. 2005 Jan. 88(1):108-13. [Medline]. Ho MH, Ho CK, Chong LY. Atypical mycobacterial cutaneous infections in Hong Kong: 10-year retrospective study. Hong Kong Med J. 2006/January. 12:21-6. Nolte O, Haag H, Hafner B. A mutation in the 65,000 Dalton heat shock protein gene, commonly used for molecular identification of non-tuberculous mycobacteria, leads to the misidentification of Mycobacterium malmoense as Mycobacterium marinum. Mol Cell Probes. 2005 Aug. 19(4):275-7. [Medline]. Lai CC, Tan CK, Lin SH, Liu WL, Liao CH, Huang YT, et al. Diagnostic value of an enzyme-linked immunospot assay for interferon-? in cutaneous tuberculosis. Diagn Microbiol Infect Dis. 2011 May. 70(1):60-4. [Medline]. Wongworawat MD, Holtom P, Learch TJ, Fedenko A, Stevanovic MV. A prolonged case of Mycobacterium marinum flexor tenosynovitis: radiographic and histological correlation, and review of the literature. Skeletal Radiol. 2003 Sep. 32(9):542-5. [Medline]. Rybniker J, Kramme S, Small PL. Host range of 14 mycobacteriophages in Mycobacterium ulcerans and seven other mycobacteria including Mycobacterium tuberculosis--application for identification and susceptibility testing. J Med Microbiol. 2006 Jan. 55:37-42. [Medline]. Travis WD, Travis LB, Roberts GD, Su DW, Weiland LW. The histopathologic spectrum in Mycobacterium marinum infection. Arch Pathol Lab Med. 1985 Dec. 109(12):1109-13. [Medline]. Cribier B, Aubry A, Caumes E, Cambau E, Jarlier V, Chosidow O. [Histopathological study of Mycobacterium marinum infection]. Ann Dermatol Venereol. 2011 Jan. 138 (1):17-22. [Medline]. Rallis E, Koumantaki-Mathioudaki E. Treatment of Mycobacterium marinum cutaneous infections. Expert Opin Pharmacother. 2007 Dec. 8(17):2965-78. [Medline]. Bhatty MA, Turner DP, Chamberlain ST. Mycobacterium marinum hand infection: case reports and review of literature. Br J Plast Surg. 2000 Mar. 53(2):161-5. [Medline]. Sato E, Imafuku S, Ishii K, Itoh R, Chou B, Soejima T, et al. Vitamin D-dependent cathelicidin inhibits Mycobacterium marinum infection in human monocytic cells. J Dermatol Sci. 2013 Jun. 70(3):166-72. [Medline]. Dodiuk-Gad R, Dyachenko P, Ziv M, et al. Nontuberculous mycobacterial infections of the skin: A retrospective study of 25 cases. J Am Acad Dermatol. 2007 Sep. 57(3):413-20. [Medline]. Parrish N, Luethke R, Dionne K, Carroll K, Riedel S. Case of Mycobacterium marinum infection with unusual patterns of susceptibility to commonly used antibiotics. J Clin Microbiol. 2011 May. 49(5):2056-8. [Medline]. Seneviratne K, Herieka E. A rifampicin-resistant Mycobacterium marinum infection in a newly diagnosed HIV-1 individual. Int J STD AIDS. 2013 Jan. 24(1):75-7. [Medline]. Kump PK, Högenauer C, Wenzl HH, Petritsch W. A case of opportunistic skin infection with Mycobacterium marinum during adalimumab treatment in a patient with Crohn's disease. J Crohns Colitis. 2013 Feb. 7(1):e15-8. [Medline].